The Rotary Club of Edmonton Whyte Ave is hosting a film screening - Bringing the Light - tells the inspiring story of how Melbourne resident, Rotarian and Peace Fellow, Stephanie Woollard started a social enterprise Seven Women and Hands On Development Tour company. It is a compelling story of how she met a group of seven disabled women while she was travelling through Nepal, who were struggling to survive by making and selling handicrafts from a tin shed in Kathmandu. 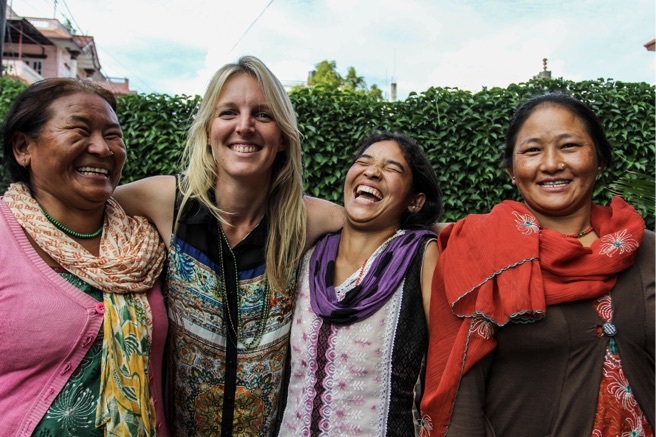 Stephanie (second from left) decided to stay in Kathmandu for three extra weeks and out of her own pocket, funded training for these women in skills to grow their chances to create an income for themselves. This documentary brings light to the astounding results of fours years of work that this United Nations award winner and author has brought to over 5,000 women. Invite a friend! Share in discussion after the film on the importance of empowering women. Learn how you can join a proposed cultural trip to visit Seven Women Center in Nepal led by these amazing women. Light snacks provided. Cash bar available featuring Polar Park's own craft beer.